« What is this Green #197? Kyle, also known as Biffard on message boards, recently shared some pictures of his nephew playing with M.U.S.C.L.E. figures. It is encouraging and heartwarming to see M.U.S.C.L.E. 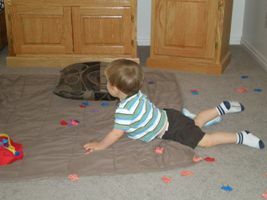 figures are still used and enjoyed by children over 20 years after their original release. 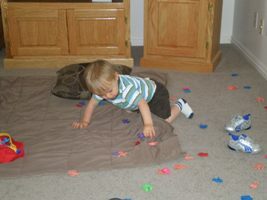 These pictures of Kyle’s nephew were taken in the living room. When his nephew comes to visit he is always drawn into Kyle’s office with the allure of colorful M.U.S.C.L.E. figures. Instead of being overly protective of his collection or worried about his figures Kyle lets them be used as they were originally intended. Kyle takes the figures out of his office and lets his nephew enjoy the figures with the extra space the living room allows. Kyle’s nephew mostly inspects the figures and then throws them around the room. This process usually repeats itself until he leaves the house or gets hungry. If you have any pictures that you would like featured, then please send them to the University of M.U.S.C.L.E. with a brief explanation of the pictures, plus how the children discovered M.U.S.C.L.E. toys. This entry was posted on Thursday, June 24th, 2010 and is filed under Sociology, UofM News. You can follow any responses to this entry through RSS 2.0. You can skip to the end and leave a response. Pinging is currently not allowed. Sociology 300 – Kyle H. | University of M.U.S.C.L.E.